I am so tired right now. I just got home from the Our Lady of Lourdes Grotto at San Jose del Monte, Bulacan. Haven’t slept yet, walked 16.5kilometers one-way trip from our place to Bulacan, survived the hustle and bustle on the way there and putting the last ounce of my energy on to writing this while the experience is still new. I really wasn’t ready to do the “walk” last year. I remembered that by the time we reached SM Fairview my feet (yup the 2 of them) were already bleeding probably because of the sandals I wore. Didn’t bring any water and didn’t even brought enough money that time so instead of buying a mineral water, I bought around 10 bandaids just to patch up the blisters on my feet. But now I have brought enough money to even eat in a resto, a jug filled with water, and wore my most durable and comfy shoe (the one I wore during the 12km walk in San Miguel, Bulacan). Distance from our place up to the Lourdes Shrine was 16.5kms (based on wikimapia), add the distance from our house to the main highway and the distance to finish the stations of the cross will sum up to around 17.5kms. Unlike last year, walking up to the Lourdes Grotto took us longer, much, much longer. We started walking from Seminaryo (my place) at around 8:30PM and arrived at our destination past 2AM. Well at first we were a bit slow since we have female company this year, but the one that ate up most of our time was the last kilometer before reaching the grotto, from Tungko to the grotto (12:30-2:10am). A few meters from tungko the pace has slowed down, much like the pace of a snail. Everything was in disarray. Vehicles which aren’t supposed to pass the hi-way (based on last year) squeezed themselves and now stuck and blocking a big part of the road, sidewalk vendors who are almost at the street whining that some of their goods were being trampled (tumabi kaya kayo ng di kayo sagabal at di kayo magreklamo), inconsiderate scooterists/cyclist who thinks they own the road and even resort in using their horns (di na nga makadaan ang tao pero ang gusto pasingitin pa sila. no choice naman kasi masasagasaan ka ng gulong nila), police/traffic police who were just whistling and waiting for their “lagay” (yup saw it 2times with a jeepney driver and a trike driver), and of course the loud, aggressive, uncultured, rowdy teenagers who were shouting curses and kept on pushing the ones in front of them. Yup it was chaos. I was drenched in sweat, feeble but never smelled (syempre dapat mabango, dapat gwapo pa rin :D). Finally we reached the Lourdes Grotto and did the stations of the cross. Did some reflections in my life, recited a passage and prayed for the continuity of blessings, good health and safety for the people dear to me. I really didn’t bother at the people (mostly teenagers) who were supposed to be a devotee, praying during that time and doing some penance while visiting the grotto shrine but Ill just want to express it here. LENT ISNT SUPPOSED TO BE A FESTIVE EVENT AND RELIGIOUS SHRINES/GROTTOS ARENT A DATING PLACE. A lot of the attendees who were teenagers used the time to mingle with each other the noisy way. Some were singing emo songs loudly (ughh) in tune with their oh so sossy phones while others with their guitars. A lot of them were smoking and just throwing the butts at the grassy side of the stations of the cross (ever heard penitence or penitensya?) and still a lot of them were doing PDA. Sheesh I had to repeat my prayers 3times in one of the stations because some people were loudly shouting, singing, flirting, laughing, cursing and smoking just beside that station. Ok ok inhale exhale calm down and try to let them be holy week ngaun. It really is sad (and somewhat annoying) to see the regressive solemnity of how filipinos celebrate the holy week. We left the grounds at around 3:20am but because of the clogged hi way outside, the jeepney driver took us to a roadtrip (yes!) 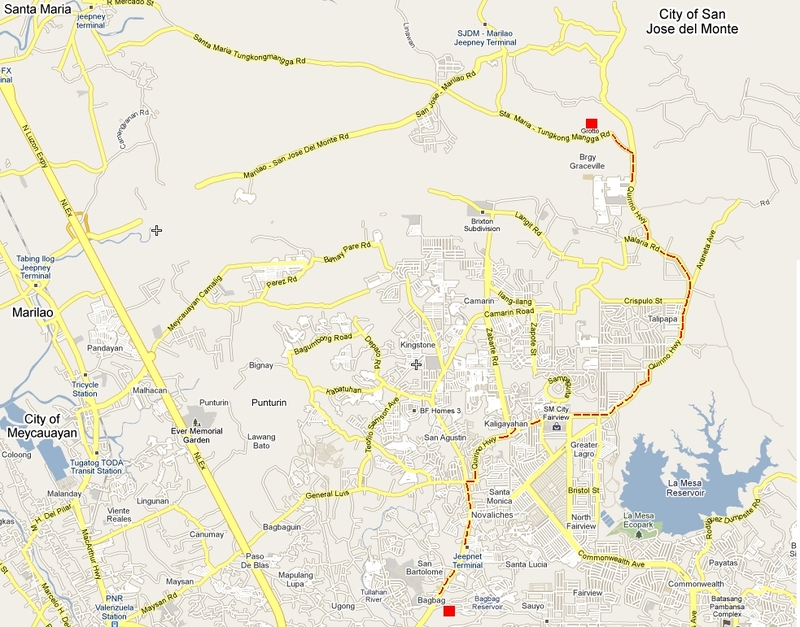 around some areas in san jose del monte, marilao, bagong silang, and zabarte and was able to return home at 6:30am. My legs and ankle ache and my eyes feel really heavy. I truly have to sleep now. ~ by endym on April 2, 2010.
thanks ms kayedee? sana naman joke lang ung last entry. sana put it into hiatus na lang rather than signing off. hay naku jameson.. kailangan ilagay pa yung dapat mabango at gwapo??? ayuss.. ok na sna blog mo! totoo yun, yung mga nagdadate jn sa grotto..really disapponting! they have to realize the real purpose of walking to the stations..to remember the sacrifices of our savior, jesus christ “aka” BRO! not to have fun.. kya yko na pumunta jan.. may issuggest ako syo.. punta ka dun sa monasteryo, sa san jose, tarlac. maganda dun promise! iresearch mo! hehehehe.. nkakamiss ka din pla.. wla ng reklamador d2 at tumatambay pra tumingin sa mggndang researchers namin.. yun treat mo ha? alam ko nami miss ako dyan, (di ako reklamador) pero teka sino ung tumatambay dyan? sino ung tumitingin ng mga researchers dyan? sino ung mag t-treat? di ako yan!!! papaano ang pagpunta diyan sa grotto if manggagaling ako ng cubao or GMA/Kamias?